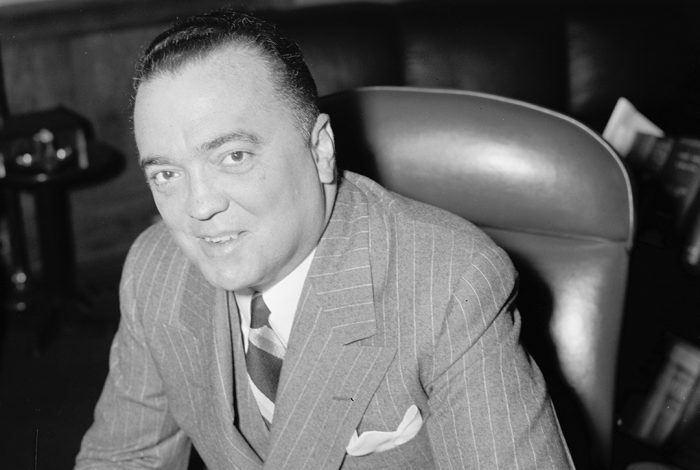 J. Edgar Hoover Photo credit: Harris & Ewing / Library of Congress / Wikimedia. Comparing himself to murdered 12th Century Archbishop of Canterbury Thomas Becket notwithstanding, fired FBI chief James Comey has been mostly circumspect in responding to Senate Committee inquiries about President Donald Trump and Russia. But he did make one assertion Thursday that jolted some historically-minded viewers to the edge of their seats. It was a comment that represents a major break with the Bureau’s longstanding policy of whitewashing the troubling legacy of its founder and director for 48 years until his death in 1972, J. Edgar Hoover. The startling answer came after Susan Collins (R-ME) queried Comey about three conversations he and Trump had in which the director purportedly assured the president he was not under FBI investigation. Comey replied in part, “I was briefing him about salacious and unverified material” — referring to independent British spook Christopher Steele’s questionable intelligence dossier. That J. Edgar Hoover routinely blackmailed (or tried to) politicians and civic leaders has long been proven. The director’s reams of compromising information struck fear across Washington, even while his own dark secrets were protected by a pliant media; a closeted homosexual in a long-time, open relationship with his second in command, Clyde Tolson, Hoover was also indebted to the mob for the numerous financial favors they showered him with. Despite his well-documented malfeasance, the mainstream media makes periodic attempts to rehabilitate Hoover’s reputation. But, at least as far as how the Bureau presents Hoover to the public, it has not deviated from purveying the well-scrubbed PR-driven image that preserved him during his lifetime as part Eagle Scout, part super crime-fighter. Indeed, it’s a unique moment in US history for an FBI director to so directly criticize the Bureau’s founding father.